Everyone should choose to stay at the Walt Disney World resort that matches their interests and personality, not to mention budget. And since there are many choices, that should not be a problem, unless of course, there are too many choices for you. 1. Deluxe Accommodations – Animal Kingdom Lodge is a deluxe and deluxe villa resort and has 2 distinct areas that have their own central lobby, check in area, restaurants and shops. The original Animal Kingdom Lodge deluxe resort is Jambo House, the Disney Vacation Club Villa resort is Kidani Village. 2. Theming – The theme of this resort is, as one would expect, ANIMALS! But it also is a wonderful study in African culture in architecture and customs. Guests are wowed by the soaring lobby with heavily timbered walls accented by unique lighting fixtures and African art. 3. Enjoy the View – The resort buildings are built with surrounding savannah and savannah-view rooms can watch the giraffes, zebras and other animals from the windows and balconies. Even if you do not spring for the savannah view room, walking the halls to the elevator you can see the animals through the floor to ceiling windows facing the savannah and in specially built covered patios with rocking chairs overlooking the savannas. There are also night vision google activities to see the animals after dark. 4. Seclusion – Since you are on the savannas, the downside of this resort is that it tends to be quite far from all of the theme parks and other activities so if you tend to have a cosmopolitan nature you may be better suited to another venue. Otherwise, the secluded nature of the resort is a welcome change from the business if the parks. 5. Transportation – Buses are the only mode of transportation at Animal Kingdom Lodge and the closest park is of course Animal Kingdom. You can walk between the 2 sides of the resort or take the van transport between the Main buildings to go to the pool, restaurants or shop. 6. Restaurants – There are several excellent restaurants at the Lodge. Saana, is a table service African-Indian based offerings is in the Kidani Village main building, they are open for dinner only. Inside Saana, there are some savannah overlook tables where you can watch the animals while you eat. The Mara is a quick service option open for breakfast, lunch and dinner at Jambo House, the main lodge. BOMA is an African themed table service buffet, open for breakfast and dinner. This is an excellent option for either meal. BOMA also has some tables overlooking the savannah (although they are few) and reservations are recommended. BOMA is one of my favorite restaurants on property and I frequently travel across property to eat here. Jiko is an African theme signature restaurant also located at Jambo House in the main lodge building and is open for dinner. Jiko is a lovely place and even if it is above your chosen price range, check out the lounge for a glass of wine or see if the Jiko wine tasting is scheduled during your visit. 7. Tours – In addition to fun places to eat there are also cultural tours of the property and the savannahs for an additional fee. There are two lovely pools on property so that you can cool off after a long day of park hopping. 8. 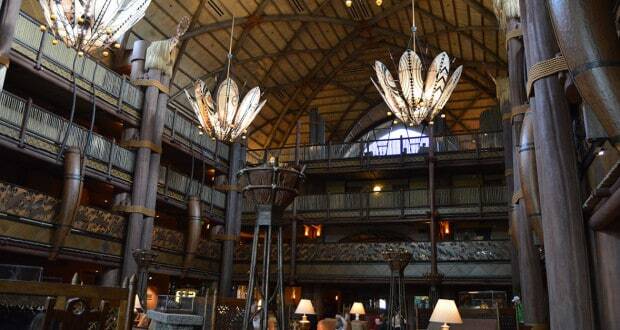 Shopping – One thing I particularly like about Animal Kingdom Lodge is the shopping< – both Zawadi Marketplace in Jambo House and Johari Treasures in Kidani Village have very different offerings for gifts and souvenirs. There is a lovely spa and fitness center and lots of on property things to do such as movies under the stars to complete your day. Whether you have some spare time to resort hop on your next vacation or think you would like to enjoy staying where you can watch the zebras and giraffes graze, Animal Kingdom Lodge is worth your time. Come over are walk out the back door of Jambo House to see the animals up close. It is particularly festive at Christmas. Want more info about Animal Kingdom Lodge, consider planning and booking your next Disney trip with an Authorized Disney Vacation Planner you can trust like Mickey Travels. They’ll help you get the best Walt Disney World deal, share expert advice and their services are totally FREE! It’s genius!